The militia has arrived in support of Cliven Bundy in his stand off against the Federal Government. 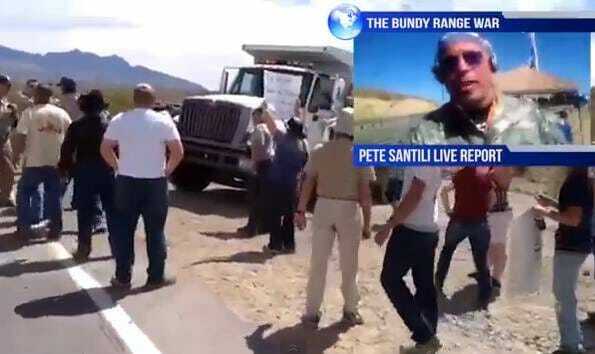 The Bureau of Land Management has surrounded the Bundy ranch with snipers, helicopters and heavy equipment. The protesters are calling for more support at the Bundy Ranch. From the video: Sheriff Richard Mack, of the Constitutional Sheriffs and Peace Officers Association, has declared the Governor’s words to be, just that – WORDS – and that immediate action on the part of the Governor should be take to call off the pending Range War. Radio Host Pete Santilli of Guerrilla Media Network, is standing by on the scene where the Militia has arrived to support the Bundy Family. Santilli said the protesters want to know if the BLM is killing and burying the cattle. More here on the real story behind the Bundy Ranch.